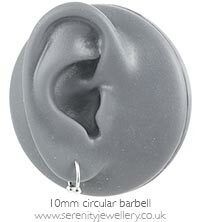 Hypoallergenic 316L surgical steel circular barbells with 8mm or 10mm internal diameter. The barbells are secured at each end by 3mm screw-on balls. I really love these earrings and haven't taken them off. for the price, the quality is brilliant and fit so nicely! I can sleep on it well too which is always something I have looked for but never found! great product. Selected standard delivery but them came in like two days anyway ! Exactly what I expected size wise and look great in my ears. Slightly fiddly to take out and put back in. My daughter loved these earrings! I bought the wrong size and so it looks a little big on my ear but I still like the way it looks, great price as well! a simple piece of jewellery, it looks good!